In every situation where people interact, a certain organization or arrangement is being established, and when every individual involved feels valuable enough to the group to speak their mind, that arrangement is democratic. Political rhetoric about democracy aside, a huge majority of our interactions are the opposite of democratic, as the space in which we relate to each other for the most part determines the nature of our relations. At work, unless we own the business or organization, the foundation of our value is our willingness to trade our time and creativity for a certain amount of money. The boom in freelance-type work, especially in the arts, and the general feeling of precarity in the workforce confirms this interchangeability. The money we earn at work affords us value in much of our lives outside of it, like while standing in line for coffee: because we intend to spend money on coffee, we are treated a certain way – as a paying customer – by the people working at the shop. But while we can order our coffee with skim or whole milk, we definitely couldn’t seriously propose – without seeming like a lunatic that stumbled in from the street – that the coffee be free, or that every barista get two months paid vacation each year. Even most baristas couldn’t suggest those ideas. This is all to say that every time we relate with each other, a specific organization of human value is being affirmed; and most of the time in our society with more private property rights than collective spaces, contrary to intuition, someone else is in charge. 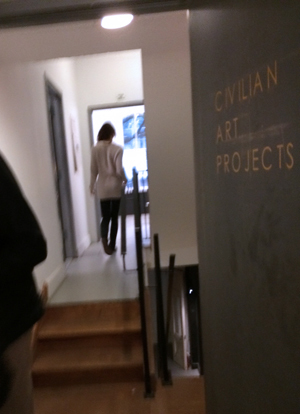 It is with this political lens on that I walked into a pair of artist talks held back to back at Civilian Art Projects in D.C. this past winter. As I sat comfortably inside the respected contemporary gallery on a grayish afternoon, two visual artists replied to questions and comments about their work. Intentions were discussed, free white wine poured. But though I was content in my warm sweater, I couldn’t shake the idea that a conversation between people obsessive about human creativity and art should be more engaging for all of us and less (seemingly) agonizing for the artists. I wasn’t expecting a political conversation, as the art wasn’t literally politically committed, but one of the results of becoming more engaged is that everything starts to look political. What follows is not an indictment of the art on the walls or even the gallery – Civilian is doing what smaller art institutions do, following the emplacements of the big museums and galleries, and trying to pay the rent – but a very brief dismantling of the traditional, capitol-A, capitol-T Artist Talk as an institutional practice, and, hopefully, an open challenge to more small galleries to think wider. The traditional Artist Talk is held as part of a series of events supporting an exhibition, and the setup is usually the same: an artist talks about her art with someone else in front of a crowd. All the old modernist distinctions are at work: between genius artist and audience; art production and reception; individual and institution. In this configuration, the artist is treated in the romantic sense, as a unique individual who created the art some time ago, and for this reason most of the talking tends to be about uncovering intentions, as if the artist made autonomous choices concerning colors, materials, and so on. The audience is permitted to pose questions usually near the end of the talk and always from the audience, but never expected to become more than only spectators. These distinctions permit the talk to operate smoothly without much control, but function above all as rules that allow the experience to seem a sober window through which to gaze at and reflect on the art and the artist’s life. Everything stays in position as things are “talked” about: artist as isolated subject, art as object, audience as outsiders, and gallery as unnoticed institution that houses all of that. That is, nothing is negotiable, besides maybe the price of the art on the walls if you’ve got the money to spend. In such an ossified arrangement, truly creative ideas tend to be held in check, and conversation about the connective tissues that unquestionably tie art and the artist to their surrounding communities and political conditions, while not explicitly denied, isn’t encouraged. That the Artist Talk is a normal thing for any gallery to throw – aside from that it gets heads in the door – is another mark, along with the ubiquitous artist statement, of the general professionalization of art practice, that trend we all can’t help but detect. To talk about her art with a group of random strangers calls for the artist to have some knowledge of aesthetic discourse, a knowledge that (usually) isn’t cheap. No wonder in the U.S. more than 130,000 people graduate with visual and performing arts degrees every year.1 As it is in the interest of a gallery to romanticize the artist, it is also in their interest to professionalize them: the more exclusive the title of ‘artist’ is, the more exclusive (higher) the gallery can price the work. That is not to say galleries shouldn’t make a profit: they compete in a capitalist, top- down market like any other business, most in big cities with climbing real estate prices. But smaller galleries presumably have some wiggle room in how they operate compared to larger private galleries and museums, since the former aren’t chained to shrinking public budgets and corporate sponsors. If connecting as many people as possible with the art is the end goal, then more democratic and innovative situations inside the gallery shouldn’t hurt. Jacques Derrida works out the idea in his La force des lois that to maintain a law also means to permanently reinvent that law (actually, I borrowed this from Boris Groys in “Politics of Installation” in e- flux 22). Like, the police that pepper-spray nonviolent protesters are enforcing a law, but they also could make the choice as individuals to put down their weapons and resist their superiors alongside the protestors. Replace the law with the Artist Talk: by throwing a talk, a gallery is also reinventing the practice. Smaller galleries should embrace their position as (somewhat) outside the art industry and redefine the Artist Talk as a practice to encourage communication outside the fixed positions of romantic artist and audience. Some, of course, already do: the best “artist talk” I’ve been to wasn’t even about the art – nearly every person standing around the room was compelled to join in because it was such a good conversation about something related to the art. And in a society that, because of its choice in economic system, doesn’t allow for many truly democratic situations, we can use more good conversations. It is of course up to you to decide for yourself if galleries – let alone art in general – are responsible for cultivating such situations. But in a economic system where most artists get paid less than software programmers, artists will increasingly have to find ways to be valued beyond the romantic notion of being an artist. And everyone interested in art can’t settle for free wine and light conversation, as comforting and seemingly real and human those things feel compared to most of our other options, because an autonomous, independent space is truly a rare occurrence that shouldn’t go to waste. There are too many forces and pressures that isolate artists like entrepreneurs, each with their own white website competing against the market of their friends, with an unfortunate lack of solidarity and political discourse. This essay was originally published on PERI0D.